The New Milford "Candlewoof" Dog Park is a lovely fenced in park located at 44 Pickett District Rd in New Milford, CT. There is a large dog area and a small/older dog area. Candlewoof, New Milford Dog Park is a 501c3 non-profit organization. All donations & memberships are tax deductible. The park area has two separate fenced in areas, one for small or older dogs only, and the larger side for all . Both areas are equipped with free "Waste Bags", conveniently stationed throughout the park. The park is funded by user contributions and donations, it is also operated/ maintained by users/volunteers and managed by a volunteer Board of Directors. We hope you enjoy our website. For pictures of our guests having fun go to our Gallery. We hope you'll come visit, enjoy the park, and perhaps consider becoming a New Milford Dog Park supporter. Be sure to bring your own water! 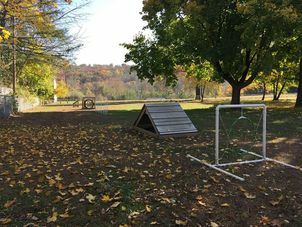 New Milford Dog Park aka Candlewoof Park , is a not for profit, all volunteer organization dedicated to providing a safe and secure area for dog owners and their dogs to play and socialize. New Milford Dog Park will promote responsible dog ownership and community education through our events and meetings.